If you are the owner or property manager for an Orlando RV and mobile home park, then you are most likely aware how these types of properties attract millions of people every year. Because of the popularity and need for RV and mobile home parks, they present an attractive revenue generating scenario through the introduction of onsite commercial laundry facilities. Commercial laundry equipment for mobile home parks in Orlando can and should be a part of every facility. Having commercial washer and dryer equipment in your Orlando RV or mobile home park can help you attract more patrons by offering them a simple, convenient and easy way to launder their clothing while on the property. 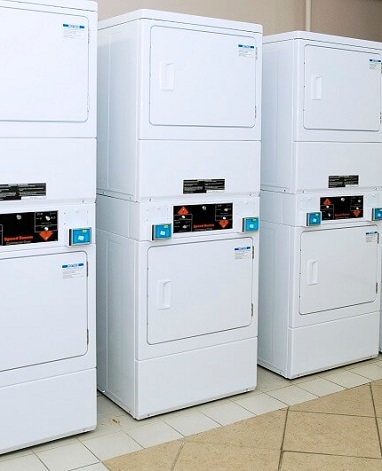 An onsite laundry facility keeps profit in your hands and removes the need for renters or visitors to travel outside of your property to do laundry. If you are intrigued and are considering adding an onsite commercial laundry facility, you might be wondering how the design and outfitting process works. At Commercial Laundries Orlando, we bring almost 50 years of experience when partnering with clients. By taking into account your budget, square footage, specific property needs, and other environmental factors, our team will help you design a commercial laundry equipment area that will impress users and get the job done. Should Orlando RV and Mobile Home Parks use Coin or Card Operated Equipment? One of the most common questions we receive pertains to the type of laundry equipment you should purchase or lease for your onsite facility. While card operated washers and dryers are the most popular for RV and mobile home parks, we also have plenty of clients who choose coin operated options. Each equipment type comes with its own specific benefits. For example, card operated equipment is known for its ease of use, as visitors or tenants use a Smart Card to complete a laundry cycle. Smart Cards have money uploaded to them via a Clean Pay kiosk located in your Orlando commercial laundry facility. Not only do Smart Cards make laundry simpler for users because there is no need to carry coins, but the Clean Pay kiosk automates and records every transaction, making bookkeeping a breeze! For those choosing coin operated washers and dryers, you will be happy to know that our equipment comes with large coin vaults that are created with theft and tamper proof materials. This will give you peace of mind that profits are safe when you aren’t onsite. Still unsure which Orlando commercial washer and dryer type is ideal for your property? Let a skilled and experienced Commercial Laundries Orlando team member help you choose the best for your needs. How Else Can Commercial Laundries Orlando Help Your RV & Mobile Home Park? There are many ways we work together with our clients. For instance, our customizable lease programs make up a large portion of our business and are personalized to the needs and logistics of your property. Leasing coin or card operated machines offers property owners and managers a way to get a profitable amenity onsite without spending large quantities of money upfront. Plus, you’ll be happy to know all of our lease clients receive free service and maintenance for the lifetime of the lease. This ensures the machinery is running at peak performance at all times, and provides your tenants and visitors with the best experience possible. Are you ready to design and outfit your Orlando RV or mobile home park with commercial laundry equipment, or upgrade an existing facility? Reach out to the experts at Commercial Laundries Orlando today and let us help make this profitable dream a reality!